In an Inside Edition interview Thursday, Anthony Weiner's sexting partner Sydney Leathers said she is proof Anthony Weiner hasn't changed. “He was making these campaign promises that he had totally changed.... I am proof that is not true,” Leathers said. Leathers also said Weiner described himself as "an argumentative, perpetually horny middle-aged man." Leathers called Weiner "disgusting" adding that "at that time I was like, ‘Oh, no, you’re not.’ But yes, he is." It's a revelation that probably should not have taken her a full year to realize. The most shocking part of the interview, perhaps, is Leathers' claim that Anthony Weiner told her he loved her. Meanwhile, things aren't looking so hot for Anthony Weiner. His unfavorability rating soared to 55 percent among New York Democrats, up from 36 percent in June. Weiner appeared hard-pressed Thursday to name the number of women besides Leathers with whom he'd had online relations since his resignation, telling reporters he doesn't believe there were "any more than three." 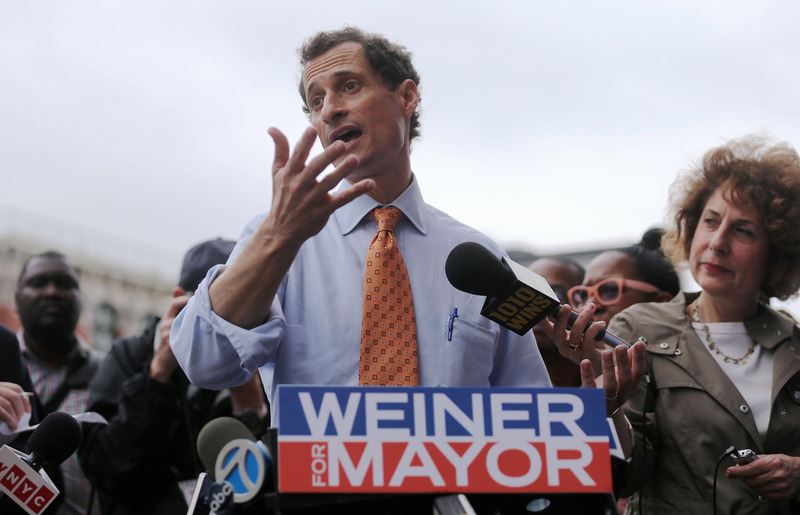 Women's groups like EMILY's List are going on attack against Weiner's mayoral campaign. EMILY's list, a political group specializing in raising money for female candidates, sent an email to supporters Friday saying, "New Yorkers deserve better than the circus their mayoral race has turned into." More entertainingly, the mayoral candidate was recently confronted by "Carlos Danger." Huma Abedin's week went from bad to worse as well, as Senator Chuck Grassley (R-IA) called for further investigation into the consulting payments she earned while also working as a State Department employee for then Secretary of State Hillary Clinton. Gloria Steinem also weighed in on Abedin, telling the New York Times "I have no way of knowing whether Huma, for whom I have great respect, is responding out of new motherhood, the Stockholm syndrome or a mystery. I strongly object to holding one spouse responsible for the other’s acts. He’s the one who should get out of the race."